* Specially for men- Precisely designed outfit male golfers' standard within higher-density sweet zone and stiff carbon shaft as well as low center of gravity to improve the shot accuracy and forgiveness. New to golf? Unsatisfied with current cluBs? 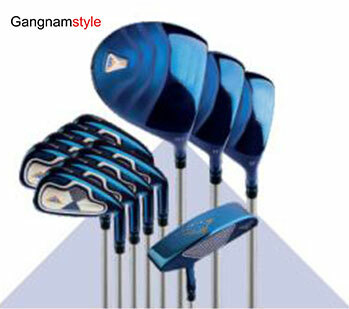 No matter what level of golf you are, thisPremium Gangnamstyle complete set with all clubs will provides you a brand new and improving golfing life with maximum playability. Gangnamstyle made of high quality materials with ultra-light and stiff shaft for men golfer, combined with its exquisite craftsmanship and advanced technology to give you the best using experience. A great alternative long and hard 8 irons with wider and strengthener alloy sweet zone for various terrains and distance, you can count on maximum shot-shape selection, allowing hit shots you never have before. Durable and waterproof PU golf bag suit for different sizes club storage. Anti-slip handle make it easy gripping or carrying. Every club has its own cover to keep a good organization and protection.